Shostakovich's creative years were lived under the Communist rule of the Soviet Union. Three articles on this website discuss what influence this had on his music. The first, entitled 'Communism and Artistic Freedom', discusses the reasons why the Communist Soviet Union restricted an artist's (or any other individual's) freedom of expression. The second article, entitled 'Socialist Realism and music', gives an explanation of why only	a certain form of art was tolerated and how that form was defined. This final article, 'The Lady Macbeth Affair', describes how this ideology impacted on the Shostakovich's music and examines why his attempt to create an ambitious Soviet opera went astray. As all Shostakovich's string quartets were composed after the opera 'Lady Macbeth of the Mtsensk District' the three articles seek to explain the social-political background of his string quartets. January 1936 was the pivotal month in Shostakovich's music: it was the moment which altered the nature of all his compositions. It changed his life. All of his works are recognisable as having been written before or after the events of that month. We will never know what music he might have composed had the Lady Macbeth affair not happened. Did it thwart his genius? or did the events of that month produce the pressure required for diamonds of brilliance? Until January 1936 things had gone very well for Shostakovich. He had rocketed to fame with his first symphony at the age of nineteen and had rapidly produced two further symphonies, two operas and music for the ballet. His second opera 'Lady Macbeth of the Mtsensk District' marked a change in style. Until then his works for the musical stage had been iconoclastic and clownishly grotesque. The Bolt - an 'industrial' ballet; the Golden Age - a ballet about a football team and the Nose - an opera about a severed nose, were all in the style of the Russian master of the grotesque, Gogol, although only the last was based explicitly on a work by him. But with Lady Macbeth Shostakovich reverted to a more traditional Russian theme - the tragic. It was biting, sordid, trenchant and highly ambitious but it was also a great success. Opera, first of all, is a vocal composition; the singers should discharge their prime duty – to sing, not to talk or declaim or intone. Thus all my vocal parts are built on a broad cantilena, taking into account all the possibilities of the human voice – that richest of instruments. I want to write a Soviet 'Ring of the Nibelungen'. This will be the first operatic tetralogy about, women, of which Lady Macbeth will be the Rheingold. This will be followed by an opera around the heroine of the People's Will Movement 1. Then a woman of our century; and finally I will create our Soviet heroine, who will combine in her character the qualities of the woman of today and tomorrow......... This theme is the leitmotive of my daily thought and will be for the next ten years. The music flows without a break, being checked only at the end of an act; it is not built of small bits, but is developed on a grand symphonic pattern. This, of course, should be considered during the production of the opera, because every act except the fourth has several scenes, and those scenes are not designated mechanically by pauses, but by musical entr'actes, which allow for the change of scenery. The opera was based on Nikolai Leskov's novella 'Lady Macbeth of the Mtsensk District' published in 1865. Lady Macbeth is Katerina Lvovna Izmailova, the bored and sexually frustrated wife of Zinovy Borisovich Izmailov the son of a wealthy merchant Boris Timofeevich. She begins an affair with Sergei, an employee of her father-in-law, which leads to her murdering four people: her father-in-law Boris Timofeevich (with rat poison); her husband Zinovy Borisovich (battered to death with a candlestick); Zinovy's young nephew Fedya Lyamin (suffocated with a pillow) and Sergei's prison mistress Sonetka (whom she drowns along with herself). The administrative district of Mtsensk lies south-southwest of Moscow, halfway to the boarder with the Ukraine. The book's title is meant ironically – the incongruity of such a brutal person in such a nondescript place. However Shostakovich makes Katerina more attractive than in Leskov's original tale. In the opera Boris becomes more repellent; the infanticide is omitted 2; Katerina shows repentance and her final death looks more an act of self-punishment than of revenge. These alterations do not change her into a Cordelia, a Desdemona or an Ophelia (Katerina is not the victim of another's insanity: that of Lear, Othello or Hamlet) rather Shostakovich displays Katerina as a victim of the society in which she lived. By the beginning of 1936 the opera had been running for two years in both Leningrad, where it had been performed 83 times, and in Moscow, where it had had 97 performances. It had also been performed in New York, Cleveland, Philadelphia 3, Buenos Aires, Zürich, Prague, Bratislava and Stockholm 4. But on 26 January 1936 Shostakovich's luck changed. That evening Stalin, Molotov, Mikoyan and Zhdanov 5 attended a performance of 'Lady Macbeth of the Mtsensk District' at the Bolshoi in Moscow. They left abruptly and ominously at the end of the penultimate act, thereby not joining in with the applause that greeted the final curtain. Their disapproval would become obvious two days later 6. On the stage singing is replace by screaming. The composer of the 'Lady Macbeth of the Mtsensk District' had to use the nervous, cramped, epileptic music of jazz to give his heroine 'passion'. Everything is gross, primitive and vulgar. The composer has obviously not set himself the task of satisfying the musical expectations of the Soviet opera-goer. So what was wrong in 'Lady Macbeth'? As is explained in the article entitled 'Socialist Realism and music', Soviet aesthetics required three elements to be present in a work of art, namely: 'ideological content', 'Party' and 'the spirit of national popularism'. Baring these in mind the official hostility to Shostakovich's opera 'Lady Macbeth of the Mtsenk District' is easier to understand. Its plot was in the tradition of 'Wozzeck' and 'Lulu' - it showed how wretched life could be and through alienating the audience to these inhuman societies it forced them to consider how much better another type of society might be. 'Lady Macbeth of the Mtsenk District' contained therefore an adequate ideological content. But the 'Party' aspect - the idea of co-ordinated human effort fixed on achieving a better future - and 'spirit of national popularism' were certainly lacking. Indeed Shostakovich's opera could be seen as the mere continuation of Berg's pre-revolutionary artistic tradition rather than a confirmation of a new Soviet opera. Socialist realism is above all a style of profound optimism. The whole historical experience of the proletariat is optimistic in essence. And we can and must affirm that optimism is intended as an obligatory feature of this style, its very essence. The performances of both works, the opera 'Lady Macbeth' and the ballet 'The Limpid Stream', were immediately cancelled and Shostakovich retreated into himself, making no effort at any public defence. Instead he worked on his Fourth Symphony in C minor, opus 43, which, according to a letter he wrote to Victor Kubatsky, he completed on the 26 April 11. The symphony was due to have been performed on the 11 December 1936 in Leningrad but at the very last minute it was withdrawn. A brief announcement appeared in 'Sovetskoye iskusstov' on that day. Clearly Shostakovich had been warned, whether by friends or colleagues remains obscure, that elements of 'formalism' might be detected in the work. So the symphony was withdrawn at the very last moment and Shostakovich began work on another, his Fifth in D minor. Certainly the music of the Fifth Symphony was unlike any other that he had written. It the cast aside the influences of the grotesque, of Dadaism and of Meyerhold’s theatre. Instead it is Beethovian; there is a sense of the indefatigable. It contained no whiff of 'Formalism'. Based on classical tradition it appeared to conform to the doctrine of socialist realism. But if his public works had become more in line with the dogma of the time, his private compositions like the string quartets, which he began to write after the Lady Macbeth Affair, became increasingly introspective. They started with the innocent First String Quartet which echoes the 'rebirth' of the Fifth Symphony and was named 'spring-like' by Shostakovich. But as they progressed, and as Shostakovich began to believe that the critical ear of the 'Socialist Realism' enforcer might concentrate more on his public works than to private compositions, these quartets would increasing abandon the innocence of spring. Photo of a poster for the première of Lady Macbeth of the Mtsensk District at the Small Opera Theatre in Leningrad. Shostakovich was referring to Sophia Perovskaya who helped in three assassination attempts on the life of Tsar Alexander II. The third, in 1881 and in Shostakovich's home city of Saint Petersburg, achieved its aim and lead to her arrest, trial and hanging. The universal repugnance to infanticide is used with dramatic effect by Shakespeare in one of his most popular plays, 'Richard III'. Having bewitched his audience with Richard's candid admissions about his murderous plans, Shakespeare quenches any cordiality towards Richard with the smothering of the young princes in the Tower of London. Similarly Shostakovich would have realised that his audience would show no sympathy for Katerina if he had her smothering her young nephew. This explains why the event is absent in the opera. In November 1933 the United States formally recognised the Soviet Union and the exporting of Lady Macbeth to opera houses in America may be seen as part of a Soviet effort to increase understanding of the USSR and to stimulate interest. Just in Leningrad in the first year the box office took in 459,087 rubles, against total expenses of 68,035 rubles. This is a return on investment of 6.75 times. On this relative measure it was more profitable than the Indiana Jones films, Spiderman or the Dark Knight. And the world takings for Lady Macbeth were much higher. Impressive though this might at first sight seem the returns on any successful musical theatre usually significantly exceed any takings on individual films because musicals and operas can run for decades (for a discussion about the finances of modern musical theatre see The Economist May 4th 2013). Stalin, a name which is derived from a Russian word, stal', meaning 'steel', was one of many aliases assumed by the Georgian revolutionary Ioseb Besarionis dze Jughashvili before the October 1917 coup. The relationship between Stalin and Lenin degenerated after his latter's stroke on 26 May 1922. (A second stroke in March 1923 effectively ended his leadership role and he died on 21 January 1924 as the consequence of a third stroke.) By the end of 1922 Lenin warned that the spirit of the revolution would be betrayed should Stalin take control. These warnings, Lenin's so-called 'testament', were successfully suppressed by Stalin in collaboration with Grigory Yevseevich Zinoviev. After gaining power Stalin had Zinoviev executed in 1936 the year of the Lady Macbeth Affair. Anastas Ivanovich Mikoyan (1895-1978) served under Stalin and Krushchev until being forced into retirement by Brezhnev in 1965. Andrey Andreyevich Zhdanov (1896-1948) became, following the assassination of the Politburo member Sergei Kirov in 1934, the first secretary in Leningrad. Later in 1944 he was made responsible for ideology and conducted between 1946 and 1948 purges against the arts. 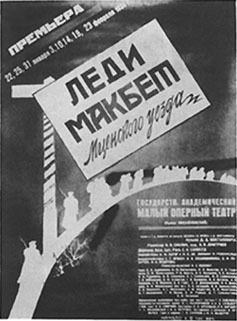 At the time of Stalin's visit 'Lady Macbeth' was being performed in no less than three theatres in the capital: the Leningrad Malïy Theatre was currently performing it in Moscow on their tour; Vladimir Ivanovich Nemirovich-Danchenko was the director of another performance running in his theatre in the city; finally a further performance was being shown by the Bolshoi on their second stage - and it was this latter rendition that Stalin visited in January 1936. Given that the opera was so popular it seems inconceivable that the culture-conscious Stalin would be surprised at the opera's content. What was the reason for his rejection of the work? A conventional opinion is that he rejected the opera's overt (and indeed musical) sexuality. This was certainly an objection heard in the West where the glissandi of the trombone which accompanied Sergei's movements during a love scene earned the opera the term 'pornophony'. But the contrasting and well publicised enthusiastic official reception of Ivan Dzerzhinsky's opera 'The Quiet Don' at this time seems rather to indicate a premeditated action to define the type of opera acceptable within socialist realism. The infamous "Sumbur vmesto muziki; ob opere 'Ledi Makbet Mtsenskogo uyezda'" was published in Pravda on 28 January 1936. A full translation of the text in English can be downloaded here. With regard to Shostakovich's person, the key phrase occurs at the end of the fourth paragraph in the condemnation. The 'may end very badly' had very sinister overtones during Stalinist purges. The subject matter of 'The Limpid Stream' is harvest time at a collective farm (kolkhoz). This ballet in three acts was first performed ar the Malïy Opera Theatre in Leningrad on 4 June 1935. There is no agreement on the authorship. Solomon Volkov (in Testimony: The Memoirs of Dmitri Shostakovich (London: Faber and Faber, 1987) p.85) names as the author the Pravda editor David Iosifovich Zaslavsky (1880-1965) - whom, according to Volkov, Lenin had called a 'notorious slanderer' and a 'blackmailing pen for hire' (Chpt 4, fn 7). Krzystof Meyer (in his book Schostakowitsch - Sein Leben, sein Werk seine Zeit, Berlin 1995, p.227 and p.565) agrees that it was Zaslavsky. But according to the musicologist Detlef Gojowy and the composer Mikhail Goldstein it was the Cultural Functionary, Viktor Gorodinsky. Laurel E. Fay, Shostakovich: A Life (Oxford University Press, 2000), p.85. Well that is the orthodox version. The brilliant but terrified composer produces the work the dictator wants - a masterpiece of Socialist Realism. Fearful of what might otherwise have happen, Shostakovich concentrates fully on nothing other than his own survival (as all of us might have done under the circumstances) and produces the	symphony which saves his life. On its performance the audience, aware of existential danger overcome, cry with relief. As I said that is the standard version. But as with everything else with Shostakovich we can expect things not to be so simple. The problem here is that the standard explanation offers a rather simplistic account of his thoughts when he composed the symphony. To understand what other thoughts he might have been harbouring first listen to this familiar piece by Bizet - commonly known as the 'Habanera' - from the opera Carmen. Unfortunately your browser does not support this audio element.	.
And now listen to the second theme of the first movement of Shostakovich's Fifth Symphony. Why on earth would Shostakovich be making references to Carmen? As it turns out, Elena Konstantinovskya, who had an affair with the composer in 1934-35, and who was briefly imprisoned during the Terror, went to Spain and married the Soviet photographer and filmmaker Roman Karmen (a train of events that figures in William Vollmann's novel Europe Central). Karmen! All this time interpreters have been trying to figure out what the Fifth reveals about Shostakovich's attitude toward Stalin; how ironic that he might really have been thinking about his love life.